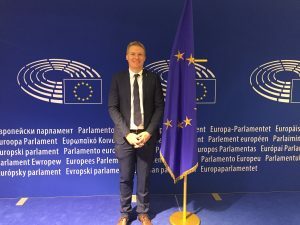 Hopeland’s CEO & Co-Founder, Nick Evans, recently had the honor of being invited to address the European Parliament on foster care and adoption policy in the digital age. He was joined by Thea Ramirez from Adoption Share who spoke about her organization’s ‘Family Match’ program which uses technology to make it easier for loving families to adopt or foster children whilst increasing placement stability and better outcomes for everyone. The invitation to speak came from Emma McClarkin MEP who has represented the UK’s East Midlands constituency in the European Parliament since 2009. She is a member of both the Parliament’s International Trade Committee and the European Parliament’s delegation to the United States. 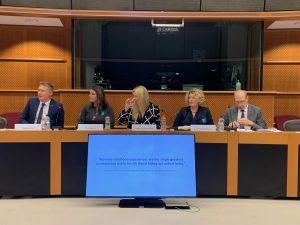 She has been a committed supporter of protecting children, including by campaigning on tackling the online exploitation and by hosting this event – which was the first ever event at the European Parliament to discuss adoption policy. As part of the event Evans and Ramirez gave a presentation entitled ‘Pioneering innovation for foster care and adoption: How big data and technology can drive better outcomes for children and families. Evans used this opportunity to highlight impactful data about children separated from families – for example there are 25 million children globally who are separated from their families but a staggering 385 million more at risk due to extreme poverty. Further, it is a fact that more than 80% of children separated from their families have living parents and it is eight times more expensive to raise a child in an orphanage as opposed to a family. This ‘big data’ shows us that there is huge potential to relocate resources away from damaging orphanages and towards family based care – whether this is family reunification, adoption, or foster care.